It would be difficult to find someone who has never heard of the nuclear bomb in Hiroshima in Japan during the Second World War. Recently I was in Okayama and Hiroshima was not very far. Thus, I went for a visit. The image above presents my favourite sculpture from the Peace Memorial Park of Hiroshima. I loved the tender expression on the woman's face, the golden sliver of the moon and the baby playing with a trumpet. In a poetic way, I think that it sums up very well why we need peace in the world and why we must never forget Hiroshima. During the Second World War Japan bombed Pearl Harbour and USA retaliated by bombing Hiroshima and then, three days later, Nagasaki. Hiroshima Bengaku Hall was one important building, parts of which were left standing after the nuclear bomb. This hall could be seen next to Ota river in the old images of the bombing site (below) taken in 1945. The uranium bomb called "Little Boy" had exploded around half a km above Hiroshima. In an area of 2 km around the explosion, all buildings were razed to ground, though houses in a 7 km radius were damaged. Only a few buildings in reinforced concrete survived. More than a hundred thousand persons died in Hiroshima, about 50% on the day of bombing and the remaining due to its after-effects. Across the Ota river, today a plaque shows a picture of the Genbaku dome building before the bombing (image below). Today Hiro (broad) Shima (island) has a population of more than 1 million persons and is the biggest city in south Japan. It is a modern city full of sky-scrappers. Ota river as it reaches near the sea, it divides into different branches (Enko, Motoyasu, Tenma, etc. 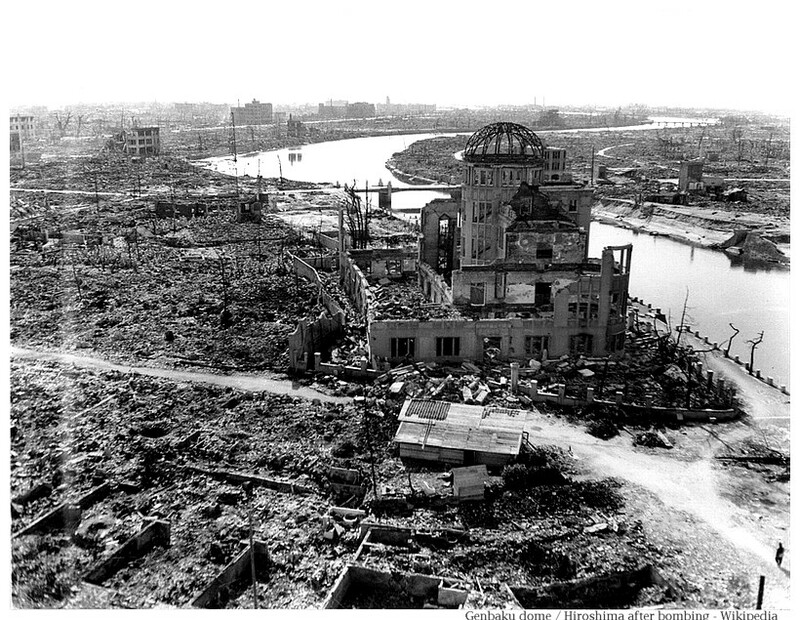 ), twisting, curving and encircling the land in a network of rivers and canals, criss-crossing the Hiroshima town. In 1949 it was decided to build a Memorial Park in this place, which lies in a small island created by Ota river and its branches. This post is about this A-Bomb Memorial Park, also called the Peace Memorial Park. I was staying at Okayama and took an early morning bus to Hiroshima. The views of the verdant hills and mountains around the highway with occasional glimpses of the sea, was the notable feature of this one and half hour journey. The Ryobi bus dropped me at the corner of Heiwa Odori street, around 200 metres from the Memorial Park. The ruins of the Hiroshima Prefactural Industrial Promotion hall, called Genbaku hall, is the iconic symbol of Hiroshima. Its skeletal round dome at the top is called the A-Bomb dome. The black signs of fire, the twisted metal staircase at its back and its blown out windows, doors and roofs are somber reminders of that 6 August morning of 72 years ago when the bomb had exploded. The Genbaku dome is the only building of this part of old Hiroshima that has been left as it was that day. In a xenophobic dog-eat-dog world, if even a single country chooses to pursue a high-risk, high-gain technological path, others will be forced to do the same, because nobody could afford to remain behind. In order to avoid such a race to the bottom, humankind will probably need some kind of global identity and loyalty. Behind the dome, in the same complex, there is a central fountain with pillars arranged in a circle, that also bear the signs of the nuclear bomb. Around the Genbaku dome, there are a number of small monuments. The first is the Red Bird monument, a literary monument to remember Miekuchi Suzuki of Hiroshima, who was a writer and the founder of a children's magazine called Akai Tori (the Red Bird). He is called the father of children's literature in Japan. The sculptures are by Katsuzo Entsuba, and were installed in 1964. The Jizoson tombstone is a relic from the bombing, placed in a building near the A-Bomb Dome. Jizoson is a Shinto deity that protects children. It was from a tombstone in a Jisenji temple. Part of the tombstone behind the statue remained smooth while other parts exposed to the thermal rays became rough. The Student Memorial Tower is a pagoda-like monument in concrete with an angel in black stone at the base and sculptures of pigeons sitting on the top. It is located behind the Genbaku dome. On its sides there were colourful shide (streamers) of Orizuro (paper cranes), often placed near shrines, memorials and tombstones in Japan. At its back there were black stone panels with scenes showing the work of student volunteers in Hiroshima. The other monuments mentioned below are scattered in different parts of the Memorial Park built across the river. The Peace Flame was lit in 1964 with the pledge that it will remain lit until all nuclear bombs on the planet are eliminated and the earth is free of nuclear bombs. The Cenotaph is an empty tomb to remember the persons who died in the bombing. It is located near the center of the park and is a concrete, saddle-shaped monument. The stone under the arch has the names of all of the people killed by the bomb. It was built on the open field and inaugurated on August 6, 1952. In the image below you can see the flame and the Genbaku dome seen from the Cenotaph arch. This monument has a central pillar with a girl standing at the top holding in her hands an Orizuro paper crane. There are two more figures of children on the sides of the pillar. It represents the story of a girl called Sasaki Sadako who had radiation sickness due to the bombing and believed that if she could make one thousand Orizuro she will be cured. However, Sasaki did not survive. This monument remembers her and the other children who died in the bombing. People place streamers of paper cranes near this monument. There are different bells in the Memorial park and museum. One of these bells placed in the garden has the words "Know yourself" written in Greek, Japanese and Sanskrit. Every morning at quarter past eight, the time of the bombing, a clock placed on a metal tower near the park entrance, plays a peace prayer. This monument has a sculpture of a couple with a child. It was created by artist Yoshizumi Yokoe in 1960. In front of the monument is a stone with a poem by a Hiroshima-born poet called Atsuo Oki, whose title is "Praying for peace and peaceful repose of the departed souls". This underground hall designed by Kenzo Tange was built by the national government of Japan in 2002. It presents the stories of the bomb survivors and their old photographs. The image below shows a fountain built at the top of the hall. This festival is held in the first week of May each year in the Peace Memorial Park. When I visited Hiroshima in the last week of April, they had started preparing the flower for this festival but it was not yet complete. The image below shows the preparation of the flower. This is another beautiful sculpture in the Peace Memorial Park expressing the hope for peace by the ordinary people. It was made by the artist Shin Hongo for the women associations of Hiroshima in 1960. Every monument and sculpture in the Peace Memorial Park of Hiroshima is about peace, hope, and prayers. Yet in spite of the sufferings of thousands of persons, we continue to live in a world that threatens new man-made disasters and catastrophes. The lessons from the holocaust of the Jews or the atomic bombing of Hiroshima, are forgotten. So what should we do as individuals? I believe that at individual level only we can promote a culture of respectful dialogue. The visit to Hiroshima was a reminder to renew my personal commitment for a culture of non-violence, the ideals of Mahatma Gandhi and the search for peace. I understand that this does not stop people fuelled by ignorance or hate or bigotry, but still as an individual I prefer to choose peace and dialogue. I want to conclude this post with the picture of an old man who was sitting near the river bank behind the Genbaku dome, feeding the birds from his hands. Prayers _()_ Thanks for the post.